This is a guest post by Pat La Londe, ASQ Fellow and incoming ASQ board chair. La Londe is a retired executive in supply chain management with expertise leading teams in all areas of procurement including supplier quality. She recently retired as an executive from CareFusion, a large medical device company. How often do you consider a company’s mission when choosing a retailer or a business partner? As it turns out, probably more often than you think. At ASQ, we recently conducted a global brand and reputation study. One of the most surprising findings of the study is that respondents rated organizational mission as highly important in their consideration of an organization that provides training, certification, membership or books/publications related to quality, continuous improvement or performance excellence. These results are encouraging us to reflect on the value of ASQ’s mission, and how we’re bringing it to our audience—whether members, customers, or the quality community at large. First, the ASQ mission is: To increase the use and impact of quality in response to the diverse needs of the world. 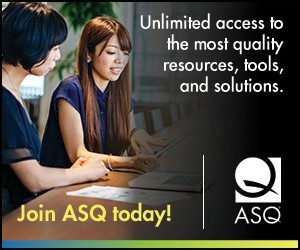 As stewards of the global quality movement, ASQ is advancing ideas, tools, techniques, and systems that will help the world meet tomorrow’s critical challenges. Yet there remain significant opportunities to dramatically and positively impact public thinking around the role of quality. What are we doing about these opportunities? We have identified the following themes that underscore our mission and developed plans to address them. • ASQ is aligned and united to grow and advance the Global Quality Community. We’re continuing to expand our global footprint with offices in the United States, Mexico, India, China, the United Arab Emirates, and Brazil. Our aim worldwide is to enhance and sustain the role of quality, help those who need quality concepts and tools for professional and organizational success, and to demonstrate the value of quality. This is, of course, in addition to our established geographic, topical, and industry-specific communities that foster career development and facilitate professional networking. • ASQ is committed to and investing in member value, this year and beyond. In the next several years, we’re making significant technological improvements to our technology infrastructure to improve the customer experience with ASQ. For example, we will be addressing our website experience, expanding offerings available in multiple formats (i.e. hard copy, mobile, Kindle), and optimizing the volume of emails sent from the entire Society. • ASQ in 2015 has its challenges, yet is responding, evolving and adapting, to ensure our members’ and customers’ success in a rapidly changing, competitive, global environment. It’s critical to the future of quality that ASQ continues to evolve and grow with its members and customers to provide them with the up-to-date knowledge and tools. By systematically studying emerging topics and monitoring the future of quality, we’re working to ensure that we respond to the global needs of today and tomorrow. For example, ASQ will be testing new membership and engagement models and programs, locally and globally, for individuals and organizations over the next year as well as increasing the Society’s attention to leadership and professional development programs. ASQ is also cultivating the next generation of leaders through programs designed for young professionals. What is your organization’s mission? Do you update and refer to it on a regular basis? All too often, leaders tend to “shelve” the mission after developing it or we take it for granted. Through our research on Culture of Quality, strong leadership is essential to developing and sustaining a culture of quality. If an organization is seeking to improve its culture of quality, a closer look at the three areas —vision, values and leadership—is likely a good place to begin. I encourage you to take a fresh look.